← Lights, Cameras, Ice… Broadway! Here in Philadelphia, we are ready for this Flyers season like no other. Sure, we are in the same boat as every other hockey fan in celebrating the end of the Bettman/Fehr bitchfest…erm…lockout. Who knows what a 48-game season will hold? Every team is going to be challenged in keeping healthy and staying competitive. With the departure of Matt Carle, injury to Andre Meszaros, and impending retirement of Chris Pronger, our defense could be in a bit of trouble. And let’s not forget that Ilya Bryzgalov is in major need of a bounce-back season between the pipes. All that said, I believe that there is another storyline we all must pay attention to, hell, we all can benefit from. I’m talking about Luke Schenn making the proverbial trek via trade (later, underperforming JVR) from Toronto to Philadelphia, joining his brother Brayden in the orange and black. That’s right, friends… brothers…HANDSOME BROTHERS! Luke comes to the Flyers’ defense after a respectable, but underperforming 2011-2012 campaign (2 goals, 20 assists). While around average for defensemen in the league, there is much more expected out of the elder Schenn. With a competitive support team of offensive power and average defensemen, not to mention a could-be-amazing goalie behind him, Luke could be poised for a breakout year. Brayden, on the other hand, has blossomed into a solid forward for the Flyers (12 goals and 6 assists in 2011-2012), a team that is looking to its young core for future success. With the leadership of Claudius Maximus (aka Giroux) as he seems ever ready for the captaincy and a supporting cast of veterans like Max Talbot, Danny Briere, Scott Hartnell, and Ruslan Fedotenko, the growth potential is infinite. Both brothers have competition, however, as Cosmopolitan recently issued their list of the hottest players in hockey. Who topped the Flyers for the honors of making the list? Scott Hartnell. SCOTT HARTNELL??? It’s true, friends… Paul Bunyan himself tops much of the league at #5 (Jaromir Jagr, former Flyers forward, also made the list). 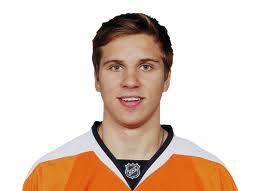 So lets settle this and be done with it as the season comes flying around the corner…who is the better looking Schenn? Is it Luke or Brayden? I’m going with Sir Luke, who most certainly jumps leaps and bounds over #HartnellDown any day of the week. This entry was posted in Philadelphia Flyers. Bookmark the permalink.